From BioWorld. 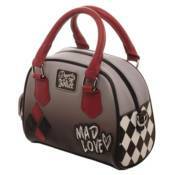 Hey puddin', be sure to get your hands on this Harley Quinn Mad Love Mini Bowler Bag from BioWorld and DC Comics. This cute bag features a grey to black ombre colored PU leather base, with Harley Quinn themed applique detail, contrasting red top handles, fully lined interior with inner pockets, and secure top-zip closure.